Robinsunne: Swap Night at the O.K. Library! Swap Night at the O.K. Library! You know, the thing I like about showing people art ideas is that you all come right back at me with fabulous ideas of your own! 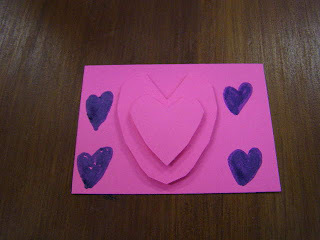 I loved ATC Night yesterday. I can hardly wait to do more. We had a strong little group last night and I got permissions to show you some of what we did. 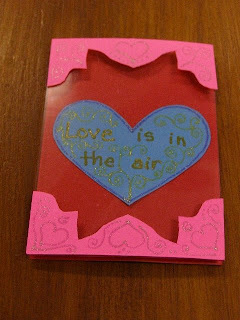 Our theme was using those little foam adhesive dots to play with making 3-D ATCs. 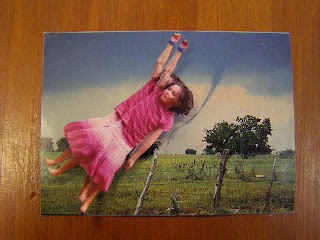 This is in my book: The Great Library ATC Swap (available at http://lulu.com/content/2470810 ). 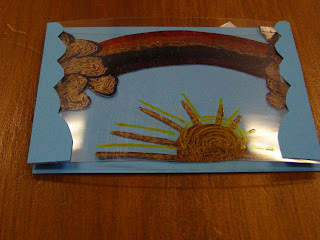 This one has the picture of a girl being swept up in a tornado - in 3-D!! Oh Nooooo! 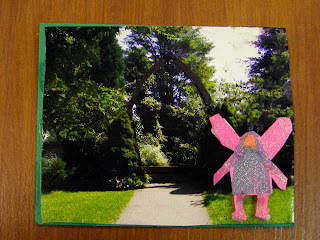 And here is a little fairy under the arch at Children's Chapel (an outdoor chapel looking out over the georgous waters of Penobscot Bay). 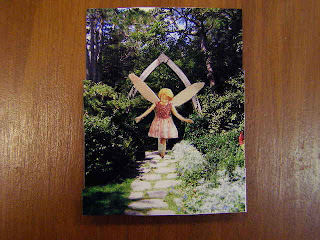 You can't tell, but the fairy is floating above the groud on her foam dot. 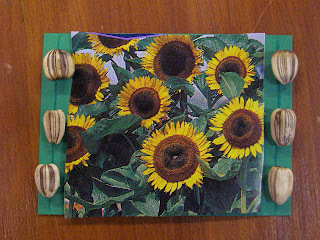 Again, in order to show the card in full I didn't shoot the angle to get the dimension: this next ATC has REAL sunflower seeds, and two layers of sunflowers. It is awesome in hand! 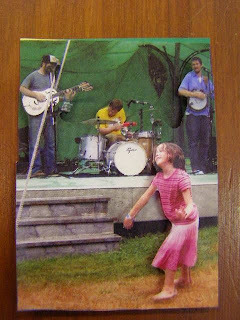 Here is a girl dancing to the band music - of course in 3-D! 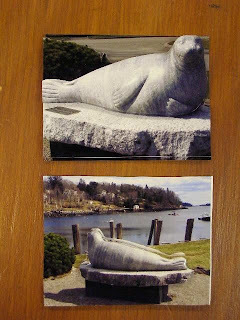 There is a granite seal in Rockport Harbor: Andre. He (the live seal) lived here in the 1960's with a local family and there is a book about him, a couple in fact, that you can get at your library. Here is Andre. Can you tell how he is layered? 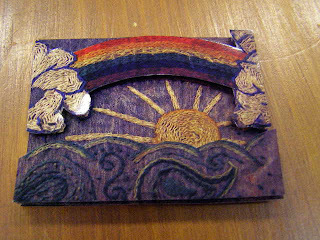 Our next ATC swap at the library is on Saturday, September 13th, at 2:30, with excellent Iris. See you there! So sorry we missed it...it was a long and exhausting day of being bored with each other while having hayfever. PS How do you like the new comment emails?? ?